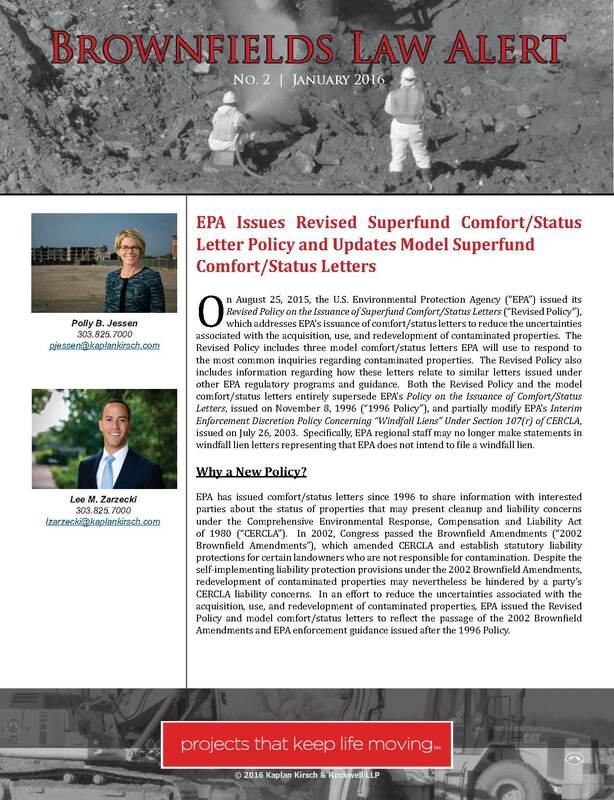 On August 25, 2015, the U.S. Environmental Protection Agency (“EPA”) issued its Revised Policy on the Issuance of Superfund Comfort/Status Letters (“Revised Policy”), which addresses EPA’s issuance of comfort/status letters to reduce the uncertainties associated with the acquisition, use, and redevelopment of contaminated properties. The Revised Policy includes three model comfort/status letters EPA will use to respond to the most common inquiries regarding contaminated properties. The Revised Policy also includes information regarding how these letters relate to similar letters issued under other EPA regulatory programs and guidance. Both the Revised Policy and the model comfort/status letters entirely supersede EPA’s Policy on the Issuance of Comfort/Status Letters, issued on November 8, 1996 (“1996 Policy”), and partially modify EPA’s Interim Enforcement Discretion Policy Concerning “Windfall Liens” Under Section 107(r) of CERCLA, issued on July 26, 2003. Specifically, EPA regional staff may no longer make statements in windfall lien letters representing that EPA does not intend to file a windfall lien. EPA has issued comfort/status letters since 1996 to share information with interested parties about the status of properties that may present cleanup and liability concerns under the Comprehensive Environmental Response, Compensation and Liability Act of 1980 (“CERCLA”). In 2002, Congress passed the Brownfield Amendments (“2002 Brownfield Amendments”), which amended CERCLA and establish statutory liability protections for certain landowners who are not responsible for contamination. Despite the self-implementing liability protection provisions under the 2002 Brownfield Amendments, redevelopment of contaminated properties may nevertheless be hindered by a party’s CERCLA liability concerns. In an effort to reduce the uncertainties associated with the acquisition, use, and redevelopment of contaminated properties, EPA issued the Revised Policy and model comfort/status letters to reflect the passage of the 2002 Brownfield Amendments and EPA enforcement guidance issued after the 1996 Policy. Parties should be aware that the Revised Policy is not a rule and it does not alter liabilities or limit or expand obligations under any federal, state, tribal, or local law. Furthermore, there is language in each of the three model comfort/status letters specifying that the letter does not limit or affect EPA’s authority under CERCLA or any other law, nor provide a release from CERCLA liability. Rather, each of the three model comfort/status letters provides the recipient with information that EPA has about the property and identifies the potentially applicable federal statutory and regulatory provisions and EPA policies. The three model comfort/status letters are (1) Federal Superfund Interest and No Current Federal Superfund Interest Comfort/Status Letter; (2) No Previous Federal Superfund Interest Comfort/Status Letter; and (3) State Action Comfort/Status Letter. Each comfort/status letter is discussed in more detail below. A “Federal Superfund Interest and No Current Federal Superfund Interest Comfort/Status Letter” may be provided when federal involvement at the property or CERCLA site is occurring or has occurred. The comfort/status letter will summarize the history and status of the property and explain if it is part of a site on the National Priorities List (“NPL”), the list of national priorities among the known releases or threatened releases of hazardous substances, pollutants, or contaminants throughout the United States and its territories. Importantly, under the Revised Policy, EPA may include a section in this type of comfort/status letter identifying the appropriate reasonable steps that a recipient should take to stop any continuing release; prevent any threatened future release; and prevent or limit human, environmental, or natural resource exposure to any previously released hazardous substance. Compliance with the recommended site-specific reasonable steps listed in the comfort/status letter may satisfy the “reasonable steps” criterion for a party to maintain its bona fide prospective purchaser (“BFPP”) defenses under CERCLA. Nonetheless, a party should always review CERCLA’s BFPP provisions to ensure compliance with the reasonable steps requirements. EPA will clarify in the comfort/status letter if it does not have sufficient information to address reasonable steps. EPA may also identify in the comfort/status letter other potentially applicable EPA guidance and state whether liens pursuant to CERCLA Sections 107(l) or 107(r) have arisen. A “No Previous Federal Superfund Interest Comfort/Status Letter” may be provided when EPA cannot identify the property in a search of the active and archived records in its Superfund Enterprise Management System (“SEMS”), a public access database that contains non-enforcement confidential information about sites where there has been some EPA involvement under its CERCLA program. A property’s absence from SEMS does not mean there are no environmental conditions that require action or that are being addressed under another federal or state program. Rather, it means that EPA is not aware of any information indicating that there has been a release or threat of release of hazardous substances at or from a facility that needs to be assessed by EPA’s CERCLA program. The Revised Policy directs EPA regions to use these types of comfort/status letters sparingly and not to express any opinion in the comfort/status letter as to possible contamination at the property or appropriate usage of the property because EPA does not have any information about the property. The comfort/status letter will also now clarify if the property was the subject of a grant awarded through EPA’s Brownfield’s Assessment, Cleanup, and Revolving Loan Fund grant program. A “State Action Comfort/Status Letter” may be provided when a state program assumes the lead of day-to-day activities and oversight of a cleanup action. The comfort/status letter will summarize the history and status of the property and clarify if it is a part of a site listed on the NPL. The letter also will identify whether the property is included in a site that is designated as state lead, deferred to state authorities, or is being addressed under a state Voluntary Cleanup Program. If applicable, the comfort/status letter will summarize EPA’s involvement at the site (e.g., removal actions, preliminary assessments and site investigations, etc. ), role in choosing the remedy, funding response work, or potential for future listing, if not currently listed on the NPL. Furthermore, the comfort/status letter will advise the recipient that the state has the primary role of overseeing cleanups pursuant to either state or federal requirements. The Revised Policy and model comfort/status letters can be a valuable resource for parties contemplating the acquisition, use, and/or redevelopment of contaminated properties because an EPA-issued comfort/status letter may provide a recipient with adequate assurances regarding potential CERCLA cleanup and liability concerns. In addition to the Revised Policy, parties may find it useful to review EPA’s Agreement and Order on Consent for Removal Actions by a Bona Fide Prospective Purchaser, issued November 27, 2006, available on EPA’s website. A BFPP may enter an Agreement and Order on Consent (“AOC”) either before or after taking title to the subject property. Furthermore, the AOC provides BFPPs with a federal covenant not to sue and protection from contribution actions or claims under CERCLA. Therefore, an AOC may provide a party with protections beyond those assurances offered in a comfort/status letter. Additional information about the Revised Policy and model comfort/status letters is available on EPA’s website. Please contact Polly Jessen with questions regarding how these letters or an AOC may be useful to your property acquisition or redevelopment project and how to obtain them.